It's 2026, and after a long career helping to run Earth's MagBeam interplanetary transit system on a shoestring budget, engineer and former Air Force boxing champion David Longrie is facing a lonely retirement, the loss of his girlfriend, and the scorn of the family he's neglected. Worse, vultures from Washington are circling, eager to shut down the MagBeam system David is desperate to maintain as humankind's best chance of avoiding extinction in a global catastrophe. In a world full of politicians, pencil-pushers, and deal-makers, David's refusal to compromise wins him few friends and fewer concessions. Everything changes with news of an accident on Mars, placing the lives of the colonists there at grave risk. Despite his determination to patch things up with his family, David is persuaded to command a rescue mission in a rickety old spaceship, the McAuliffe, that he's made his pride and joy. 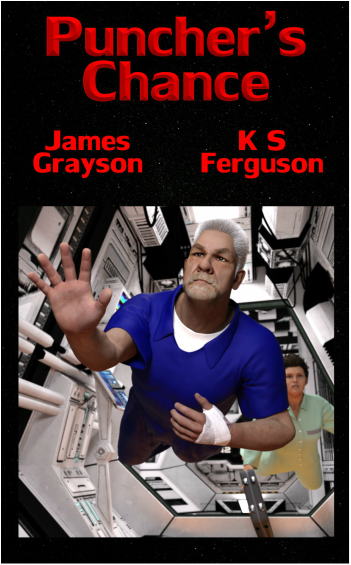 It's a decision he regrets when Victoria Porter, Washington's favorite torpedo and a staunch opponent of the space colonization program, bullies her way on board. And David’s reluctance is soon justified when disaster strikes, leaving half of the crew dead or injured, and the McAuliffe without power and drifting into the unknown. David and Porter are opposed in every way, but the peril in which they find themselves will both bring them together and drive them apart as they struggle for survival in their crippled vessel. And with the lives of the Martian colonies at stake, their decisions—and the courage it takes to risk your own life for those of strangers—may come to rule the fates of many. Buy Puncher's Chance for your Kindle. Puncher's Chance (co-written with James Grayson) appeared in the June 2006 edition of Analog Science Fiction and Fact, America's longest-running science fiction magazine. Puncher's Chance was voted the 2nd best novella in that year's Analytical Laboratory Awards, held during the 2006 Nebula Awards weekend in Tempe, Arizona. It is an exciting and cautionary tale about the dangers—and necessities—of travelling to other worlds, and how extreme circumstances make cooperation possible between even the bitterest of adversaries. James Grayson has been writing more or less since birth. He has a Masters degree in Physics and a BS in BS. He lives in England with his cat, Jack, a hair-care model. If he thinks of anything else to say, he'll call you at home. "This story will have you at the edge of your seat... [and] shows the reasons why colonization beyond Earth is so important... A well-written SF morality tale with memorable characters." "An exciting tale about a man who must get medical supplies to Mars to save colonists' lives.... a good story of redemption and heroism." "When a medical emergency breaks out on the planet, an old transport is pushed back into service to rush a cure to the colonists, but it's a voyage that's anything but easy... It's my kind of science fiction story." "Ferguson and Grayson bestow an unexpected personal dimension on their characters as they interact in the face of the emergency."